The Geneva show has traditionally been seen as the European motoring industry's foremost new car showcase. While the 2018 event is similar to previous years – the rotating car platforms and strobe-lit press conferences remain – there's a growing sense that great changes are afoot. As Ken Ramirez, Nissan's head of sales and marketing observed – the kinds of questions being asked now simply didn't exist 10 years ago. So what's driving the change? Naturally, it's those two intertwined megatrends that aren't far from any OEM's lips these days – electrification and autonomy. Nearly all the major automakers represented in Geneva have at least one model on their stand featuring one, if not both, of these new technologies. Of course, there's little activity in this area from low-volume, high-performance automakers such as Pagani or Bugatti for whom a self-driving electric model would totally miss the point. But that isn't to say the supercar field was free from electrification, with Croatian supercar maker Rimac showing off its C_Two. It claims a ludicrous sub-1.9-second run from 0-60mph while also mustering 403 miles of range on the NEDC test. If that's too road legal for you, Seat's recently split off high performance arm Cupra is displaying a concept dubbed the e-Racer. This strictly track only race car is based loosely on a Leon hatchback but gets a ludicrously wide bodykit, gigantic aero add ons and a powerful electric motor driving the rear wheels. The e-Racer can put out 402hp continuously or 670hp at peak which should make for some seriously quick lap times. Leaving the land of burnt rubber and G-force behind, mainstream automakers lined up to show off their self-driving and electric tech. VW had its I.D.-branded models out in force including the new I.D. Vizzion sedan – said to preview a production model expected in 2022. Early production versions will still have physical controls for human drivers but later ones will remove these in favour of full level-five autonomy. 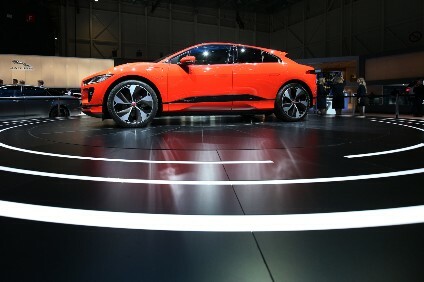 Jaguar showed off its i-Pace electric SUV in full [contracted out to Magna Steyr] production spec. It uses a pair of electric motors to provide four-wheel drive and 395hp while its 90kWh battery pack is good for up to 298 miles of range. Its self-driving tech is currently limited to automatic cruise control with lane-keeping assistance but tech-savvy owners will be able to control some of its functions from their Alexa smart speaker. Meanwhile, Mercedes launched the AMG GT 4-door and BMW showed off the M8 Gran Coupe Concept but neither made much noise about their electric or autonomous vehicles. The only real headline being BMW's revelation that the outlandish i Vision Dynamics concept revealed at Frankfurt last year will be called the i4 when it reaches production in a more muted form around 2020. Mercedes did, however, address another growing trend in the industry – the question of what car ownership could look like in the future. Its new and intriguingly named Mercedes me Flexperience offers users the ability to drive up to 12 different Mercedes vehicles per year in return for a subscription payment. It's not clear when and how far the service will be rolled out but two large German dealers are already signed up to trial it. Crossing over to the French section of the hall, it was hard not to be distracted by Peugeot's 4.8-metre lion sculpture. Thankfully, the new and surprisingly handsome 508 saloon was enough to draw the eyes away with its claw-like LED running lights and low, sleek proportions. Citroen, meanwhile, showed the third-generation Berlingo 'leisure activity vehicle' – a segment it claims to have invented back in 1996 with the original model. Of course, it wouldn't be a motor show without an ambitious company claiming its new model will revolutionise the industry and PAL-V was more than happy to step up. It claims the Liberty, due to hit the road/sky in 2019, will be the first fully certified flying car. With none other than Iron Maiden's Bruce Dickinson on stand to extol its virtues, the Liberty can transform from a three-wheeled car into a gyrocopter in around 10 minutes, and take off and land at small airstrips. Surveying the hall, there's a sense of caution from many automakers. Few laid out long-term plans for future electrification and autonomy and simply highlighted their current efforts or their next tentative steps. It seems that uncertainty over what direction future buyers will take is leading OEMs to hedge their bets rather than put all their eggs in one technology's basket. You're also left with the impression that turning up with the latest four-wheel drive, turbocharged, dual-clutched megacar is going a little out of fashion amid global concerns over growing pollution and congestion.